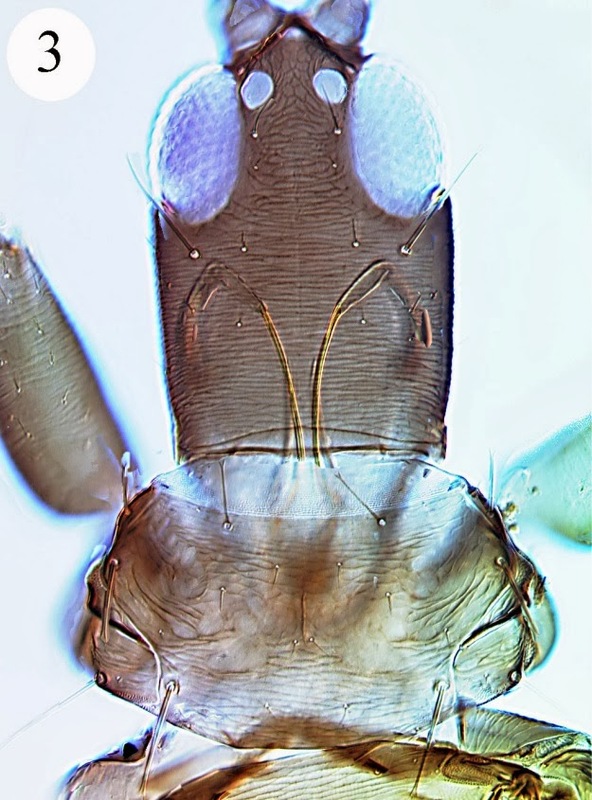 Head and pronotum of Apelaunothrips consimilis, from Mound (2013). The Apelaunothripini are a group of fungus-feeding thrips that have the maxillary stylets slightly broader than in other members of the subfamily Phlaeothripinae (though not as broad as in the Idolothripinae). Characters (from Mound & Palmer 1983): Antennae long, slender, with eight segments. Maxillary guides stout, maxillary stylets relatively broad. Metathoracic sternopleural sutures absent. Males with B2 setae on tergite nine short and stout. Mound, L. A. 2013. Species diversity in the Palaeotropical leaf-litter genus Apelaunothrips (Thysanoptera, Phlaeothripinae). Zootaxa 3741 (1): 181-193.